A Viewpoint on Mormonism episode on this topic will air during the week of April 15th. During the weekend of March 10, 2019, The Church of Jesus Christ of Latter-day Saints flew all fifteen of its general authorities to Rome, Italy–a nation where up to 85% of its residents are Roman Catholics–as the newest temple built by the 16-million member church was officially dedicated. Among other events that weekend, President Russell M. Nelson was given a personal audience with Roman Catholic Pope Francis. There were many other photo ops as this was the first time in history that all fifteen general authorities had been together in one place outside the United States. The comparison was clear. 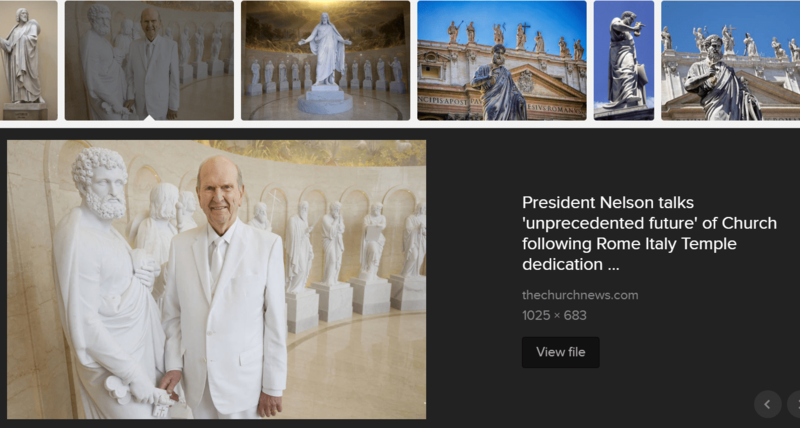 Peter, whom the Roman Catholic Church claims to be its first pope, is the head of the “former” day saints; Nelson, meanwhile, is the leader of the “Latter-day Saints.” Seeing the photo for the first time, my jaw hit the ground. Understanding a little bit about LDS doctrine and teaching is important to comprehend what was intentionally meant. The Church you belong to, The Church of Jesus Christ of Latter-day Saints, is the restored Church. When you know what restored means, you will understand why standards of conduct are as they are. Following the Crucifixion of Christ an apostasy occurred. Leaders began to ‘teach for doctrines the commandments of men.’ They lost the keys of authority and closed themselves off from the channels of revelation. That lost authority could not just be repossessed. It had to be restored by those who held the keys of authority anciently. The Church of Jesus Christ of Latter-day Saints is not a remodeled version of another church. It is not an adjustment or a correction or a protest against any other church. They have their ‘form of godliness’ and their goodness and value” (“The Standard of Truth Has Been Erected,” Ensign (Conference Edition), November 2003, p. 24). One by one, the Apostles were killed or otherwise taken from the earth. Because of wickedness and apostasy, the apostolic authority and priesthood keys were also taken from the earth. The organization that Jesus Christ had established no longer existed, and confusion resulted. More and more error crept into Church doctrine, and soon the dissolution of the Church was complete. The period of time when the true Church no longer existed on earth is called the Great Apostasy. Soon pagan beliefs dominated the thinking of those called Christians (Gospel Principles, 2009, p. 92). Occasionally, The Church of Jesus Christ of Latter-day Saints is criticized for teaching doctrine not found in the Bible. In reality, the teachings of the Church reflect reiterations of truths once had in Christ’s Church that were lost through many centuries of apostasy and the consequential absence of divine authority and priesthood keys (“Latter-day Scripture,” Church News, January 10, 2009, p. 16). What is important to note is that only one can hold these keys at a time. Referring to LDS Church founder Joseph Smith, D&C 132:7 states how “there is never but one on the earth at a time on whom this power and the keys of this priesthood are conferred.” (Also see Teachings of Presidents of the Church: Joseph F. Smith, p. 224; History of the Church 6:46; Teachings of the Prophet Joseph Smith, p. 324; the Book of Mormon Student Manual Religion 121 and 122, 1989, p. 46.) Today that man is the president of the church. Any of the General Authorities may speak the mind of the Lord and thus proclaim scripture, but only the living Prophet has the keys necessary to declare, clarify, or introduce doctrines and commandments for the entire church (Magnifying Priesthood Power, 1989, p. 109). This is the true Church, the only true Church, because in it are the keys of the priesthood. Only in this Church has the Lord lodged the power to seal on earth and to seal in heaven as He did in the time of the Apostle Peter (“The True and Living Church,” Ensign (Conference Edition), May 2008, p. 20). Where did the Photo Go? With these citations as a background, perhaps it can be seen why this photo turned my head. Could it have been doctored in Photoshop? It had to be! After all, we live in a world where no photo can be trusted, especially of a smirking LDS president suggestively accepting marble keys from Peter. It would certainly be considered offensive by the Roman Catholic hosts who allowed for the Mormon temple to be built in Italy–and Rome, for that matter, where the Vatican lives! In fact, I as a Protestant was offended when I saw it. President Nelson was joined by every member of the First Presidency and the Quorum of the Twelve Apostles in Rome, one of the most influential cities in the history of Christianity. 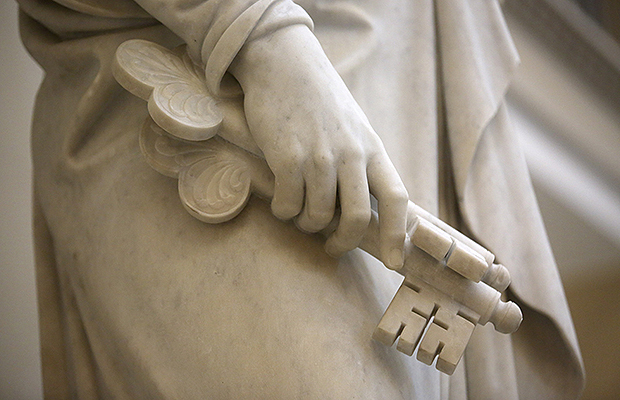 The Church leaders stood together on March 11 in the Rome Italy Temple Visitors’ Center for iconic photographs — symbols of their unified testimony of the Savior Jesus Christ. This reference to an “additional photograph” is more proof that this questionable photo was not doctored or created out of someone’s imagination! So why did the church delete this tasteless photo? Did the leaders respond to complaints? Or did they come to realize how offensive it was? We may never know the real answer. Regardless, it is obvious that this attempt to be “cute” should have been kept on President Nelson’s cell phone and never made its way onto an official church website.